With consequences that span generations, transportation projects are among the most expensive investments that communities undertake. They can embed existing inequities more deeply into our communities; create new inequities; or, at their best, alleviate some of the more pernicious dimensions of inequality, even if only at the margins. As the authors Anantakarishnan and Gramsamer persuasively contend in their report, transport serves as a significant ‘gateway’ service that can either bolster or erode all of the factors that support a high quality of life. Historically, the process to evaluate equity has been incomplete, time-prohibitive and complex, or retrospective. As a result, transportation planning has tended to exacerbate rather than alleviate existing social inequalities. Often with no ill-intent, planners disadvantage those who rely on public transit the most and make it ever more difficult to connect to employment possibilities across the metropolis. Consideration of equity factors at the beginning of the planning process is necessary to ensure outcomes that are more positive. 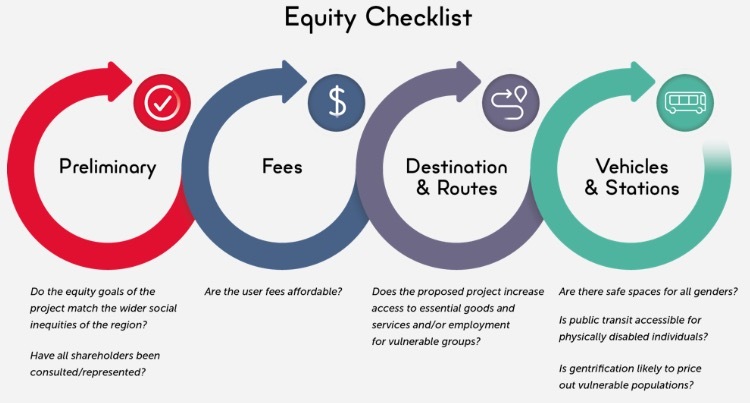 As the authors recommend, during the early planning stages we need to consider and balance the tradeoffs, and systematically ensure minimum levels across each of the various dimensions of the nexus between equity and mobility (Figure 1, above); which is why the recommendations and resulting equity checklist and framework in this report are so noteworthy. So, if we do not incorporate issues of equity into public transit we will only bake existing inequalities into the future structure of our cities and regions; thereby maximizing - rather than minimizing - their damaging effects on our society. This is why the authors’ case for incorporating equity analysis into planning is so compelling; and why their proposed Equity Checklist is so prescient (Figure 2, below). To use one small illustration, society relies more and more on credit-based electronic payment systems for charging users of transport services, from credit-based and internet-based on-demand transportation, to toll transponders. All are very efficient for everyone; arguably more efficient than cash-based payment systems. This is an example of getting the mathematics right. That is until we recall that somewhere around 75 million adult Americans do not have a single credit card. While 80 per cent of Caucasians have credit cards – which might be considered “complete coverage,” credit card access drops off to 70 per cent of Latinos and just under half of African Americans. By developing transportation systems that depend one way or another on credit rather than cash, we potentially exclude, and therefore drive greater inequity for millions of Americans and hinder use of services that have been built at least in part with public resources. This is where the planning approach promoted by the authors enters. Accommodation can be made if the problem is considered up front. Columbus, Ohio offers one example of such an effort. In 2016, the US Department of Transportation awarded the City a US$40 million grant to re-imagine mobility throughout the Ohio capital. This federal support has enabled the city to develop a comprehensive, integrated strategy addressing challenges in residential, commercial, freight and downtown districts. The resulting action plan - to be implemented beginning in 2019 and 2020 - incorporates several new technologies, including connected infrastructure, electric vehicle charging infrastructure, an integrated data platform, autonomous vehicles, and more, to advance the mobility of all residents regardless of their socio-economic status. Equity remains an essential consideration for any proposed transit system; no matter how advanced it may be technologically. Moreover, at every stage, planners in Columbus have drawn on the views of residents, community and business leaders, as well as technical experts to ensure that the human dimension of transportation shares pride of place with technical demands. 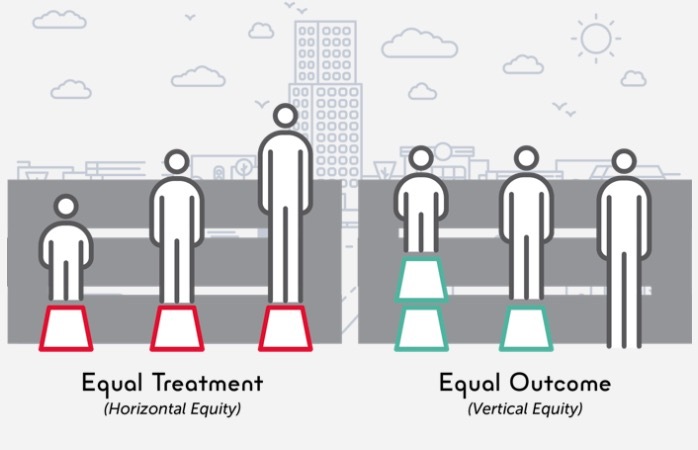 Restated, rather than by simply embracing and balancing equal access and treatment to assume that all will be served (Figure 3 below), planners have tried to generate equal outcomes by accommodating variable technologies, socio-economic status, and physical location. The scheme was simple - as modest as calculating algorithms, which evaluated the relationship between price and willingness to pay together with congestion. Raising the price encourages drivers to find alternative routes until traffic flows freely. The scheme has worked in its own terms. It appears that the operators got the math right and traffic flows more smoothly even though tolls reported to have reached as high as US$40.00 at times. However, the scheme has worked for whom? All of which leads us back to the perspective of this report. Viewed in isolation, the experience of I-66 precisely accomplished what it intended to. However, it was based on some assumptions that would not have passed muster with our authors. It assumes that everyone can afford price elasticity; it assumes that people have access to reasonable alternative transit modes, and it assumes that those who live the furthest and would benefit the most can afford to pay the tolls. In other words, that everyone is more or less a healthy adult with a steady, reliable income. Meanwhile, rising housing costs force many people to move from the city and suburban employment centers, only intensifying the spiral of unaffordability. In structuring their partnership with the private sector, a common trend in transportation finance, Virginia planners achieved one goal: maximizing profitability, but did so at the cost of social equity and arguably welfare (Figure 4 below). As the framework highlights, equity comprises many dimensions. This can be complicated by the historical context under which the transit systems were developed. For example, US cities have had notable success in ensuring the physical accessibility of transit systems, thanks largely to the 1990 Americans with Disabilities Act. By guaranteeing equal opportunity for individuals the US has become the global leader in barrier-free access. However, these systems only serve a small percentage of the total trips. Compare this to Germany, which has one of the best transportation systems in the world, but until 2013 had no legal requirements for accessibility. While 90 percent of Germans live within 1km of public transit and facilities are reliable and modern, trains cannot accommodate wheelchairs, and only half of the train stations are barrier-free. However, unlike more complex questions of equity, with sufficient funding, the solutions here are clear – legislative mandates. In this case, Germany has set a goal of being barrier-free by 2022 and dedicated the resources to accomplish it. This impending and certain challenge highlights the need for the forward-looking, equity-centered approach facilitated by the Equity Checklist. Much like environmental considerations that have been incorporated over the past 15 years, its use could extend beyond planners at the municipal level to international financial institutions as part of their systematic evaluation of infrastructure loans. As Anantakrishnan and Gramsamer argue cogently in this report, equity considerations are not tangential to the success of mobility planning but central to the task of enabling society to move easily to fulfil life’s tasks and society’s missions. Effective transportation planning requires multi-dimensional and long-term thinking precisely because their outcomes shape cities, communities and human lives for generations ahead. Moreover, because cities are complex and humans fallible, the greater the engagement with the human dimension of mobility the greater the probability that the technical dimension of transit planning will succeed in making our communities more mobile.